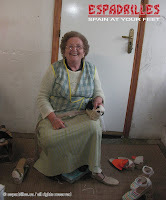 Allow me to introduce you to Rosa, one of the many “abuelas” (grandmothers) living in a small village (population 2000) in the north of Spain. 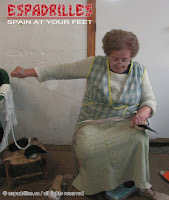 In a hand full of Spanish villages, the centuries old tradition of villagers hand sowing the espadrille in the comfort of their own home still remains. 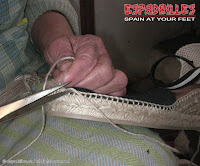 These adorable abuelas sew the espadrilles by hand with an ancestral technique, always using the same tools and making the exact same motions. 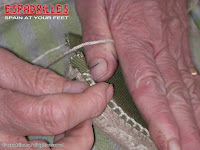 The pictures below will help you appreciate in detail the full charm of the technique. 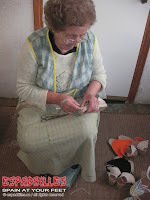 See for yourself how Rosa receives at home the different elements (sole, fabric and thread) and assembles them with amazing speed while gossiping with friends. 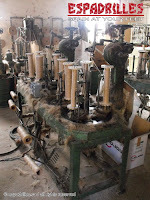 These braiding machines dating from the 50's are still in use in the village. 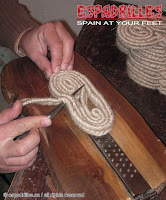 The jute thread spins and forms the rope used to make the soles of the espadrilles. 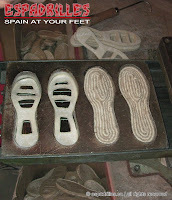 And here’s Ramon Junior! 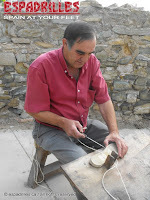 Now that the rope is ready, his work consists in rolling the jute in order to form the soles. 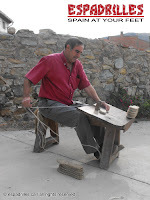 To do so, he uses a turning table that has been used for generations by his family. 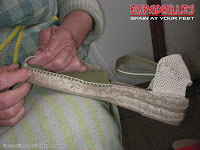 Hand sewing the soles is the key to a solid espadrille; as you can see, Ramon sews on a special bench called "banco alpargatero", used in his family for many generations. 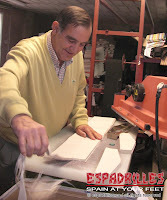 Paco the rubber man! 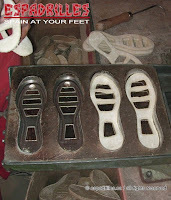 In order to finish the sole, natural rubber will be vulcanized to the jute with the help of a heated mold (400º Celsius). 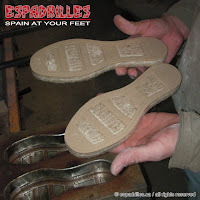 This rubber sole will solidify the jute and provide a good grip to the sole. 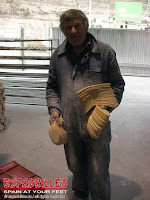 Here's Ramon again! 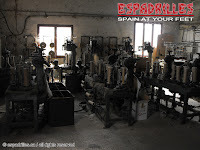 He will not share the responsibility of his delicate tailoring job, cutting the fabric is the most difficult part of the "espadrille" operation!